“One man’s making cheap booze is another man’s crafting an ecosystem in which a microorganism can thrive.” That’s my usual response whenever someone’s eyes go wide upon hearing that (a) I’ve used home brewing examples in my general chemistry class or (b) I’ve started plotting how to turn my six-week-old son into a young homebrewer. My love affair with homebrewing started in graduate school, where I was mesmerized by a group of older graduate students who were obsessed with brewing beer at home. This was back in 2010, before the “craft beer revolution” was co-opted by every dime-a-dozen hipster between Greenwich Village and The Mission. Cynical enough to be driven to drink but clever enough to apply chemistry to produce alcohol, my pioneering idols could be heard every Friday night discussing the challenges of growing hops at home or the merits of various sparging methods (read on). I was hooked. I got started in home brewing when a Mr. Beer kit showed up under the tree one Christmas a few years back (thanks, mom). Newbies and experienced brewers alike love to read books and magazines written by a whole crew of pseudo-celebrities who regularly publish books and magazines promising the perfect brewing process, reminiscent of Calvin and Hobbes’s Chewing Gum Magazine. (Okay, we’re not quite that bad. But we’re pretty bad.) What’s the perfect mash temperature? How much Sparge water should I use? Is my local water okay, or should I add minerals to it? Usually these works are heavy on oral tradition and light on science, which is surprising for a hobby dominated by engineers. 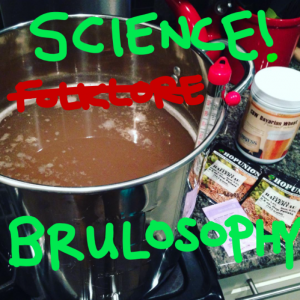 Enter Brulosophy, a blog that demystifies homebrewing with SCIENCE! Ring leader Marshall Schott is a clinical psychologist and homebrewer (take that, engineers) on a mission to test the mountain of informal homebrewing advice that has accumulated over the years. In a typical exBEERiment (xBmt), he brews two batches side by side using identical techniques, altering only a single variable. He then gathers a group of testers and does what is called a triangle test—more or less a scientific version of “two truths and a lie.” Each tester gets three beer samples, two from batch A and one from batch B. The tester’s task is simply to identify the unique sample from batch B. The logic goes that if a significant number of testers are able to correctly identify the unique beer, changing the variable during the brewing process had a significant impact. Marshall is careful to recognize the limitations of his approach. The triangle test does not assess which of the two batches is better, just whether changing the variable by a specified amount makes an impact on the final beer. In essence, each experiment answers the yes-no question: does changing variable X by amount Y cause a noticeable difference in the final beer? Some exBEERiments include follow-up studies that address quality, but these are generally very subjective. Still, the folks at Brulosophy have built up an impressive body of exBEERiments addressing everything from the ideal material for fermentation vessels (PET plastic versus glass, the eternal battle) to whether clarifying agents are worthwhile (they’re nuts for gelatin but surprise, it doesn’t have a significant impact). Their table of xBmts even lists a p-value for each trial, a statistical measure of how likely it is that the two batches are not significantly different. If you’re looking for an impact, a smaller p-value is better. Below, I’ve organized some of the more notable xBmts by the relevant stage in the brewing process. For those of us familiar with the typical brewing lore passed down on stone tablets through the ages, his results contain some reassuring results but quite a few surprises. Check out the table below for some of the most interesting results. Water chemistry – mineral adjustments The homebrewing demigods tend to downplay the importance of minerals in water, as it’s fairly easy to overdo it and end up with a carboy full of saltwater, but Brulosophy’s results indicate that minerals can have a big positive impact on the final beer—at least for Dry Irish Stout and Belgian Pale Ale styles. They observed an effect both before the mash and after fermentation. Mashing Liquor-to-grist ratio What would brewing be without jargon? Brewers call the grains used in the mash the grist, and the water used the “liquor.” That’s right: we’re such a bunch of alcoholics that we call water liquor. Figures. Although the “grain heads” like to make a big deal about the water-to-grain ratio in the mash, this xBmt indicates no perceptible impact on the final beer. Extract vs. all-grain The “feud” between extract and all-grain brewers is legendary. Extract brewers use pre-mashed solid or liquid malt extract and start with the boil; all-grain brewers (they’re just the snobbiest) start from crushed grains and run their own mashes. An xBmt with pale ale showed a difference between the extract and all-grain recipes, but Marshall is careful to say that it doesn’t mean that all-grain is better. Single infusion vs. step mashing Different chemical reactions occurring in the mash have different ideal temperatures. The idea of a step mash is to hold the liquid at a series of temperatures to get the most out of all of these reactions. Single infusion involves using a single temperature throughout the mash. Although the difference was subtle, a significant number of testers could tell the difference between single-infused and step-mashed beers. This is in line with expectations, but the difference was more subtle than the experimenters expected. Sparging Fly sparging vs. batch sparging vs. no-sparge Who knew there were this many ways to introduce water to wort? Traditionally, how sparge water is added to the grains affects the yield of starches extracted (efficiency). A series comparing these three methods in a pair-wise way confirms it: sparge method has an important impact on the final beer. Fermentation Rehydrated vs. sprinkled dry yeast Some homebrew books advocate dissolving dry yeast cells in a little bit of “side wort” to beef them up before sending them into the big game—that’s called rehydration. Others warn that rehydration can introduce bacteria into the fermenting wort, especially if the side wort is not properly sterilized. I’ve never rehydrated dry yeast and it’s worked fine for me; this xBmt also supports the idea that rehydration has no noticeable impact on the final beer. Yeast pitch rate More yeast is generally described as better (they can grow, but they suffer in the process), and this xBmt confirms that yeast pitch rate does have an impact on the final beer. PET plastic vs. glass fermentation vessel Much to my own chagrin, using glass instead of plastic as a fermentation vessel did have a significant effect on the final beer. In a separate xBmt, stainless steel and glass performed equally well. Dry hopping Adding hops after the boil to the fermentation vessel is known as dry hopping. A series of xBmts demonstrated that the temperature, length of time, and quantity of dry hops all have a noticeable effect on the final beer. The form of hops had only a significant effect (p = 0.029).